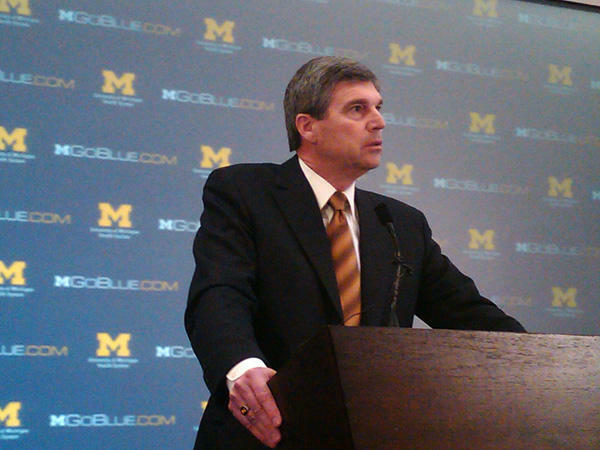 University of Michigan Athletic Director David Brandon at a press conference announcing the firing of Rich Rodriguez. Now that University of Michigan football coach Rich Rodriguez has been fired, David Brandon says he'll work fast to find a replacement. 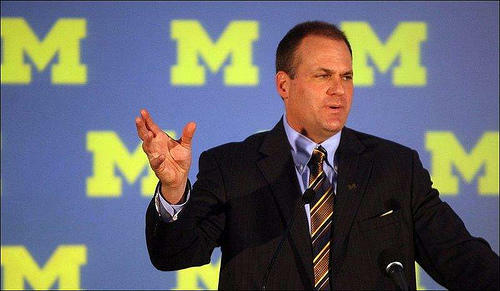 Brandon was hired one year ago as the University of Michigan's Athletic Director. During the past twelve months the U of M football program has been his primary concern. The football team has struggled on the field and violated NCAA rules off the field. Now, the once premier football program faces years on probation and an uphill climb to become truly competitive. “This individual has to be able to compete at the highest level. The expectations here are extraordinarily high. The passion for this football program is unbelievable. If you don’t believe me, you should see the email traffic. There are people out there who care. And it’s beyond just sport for them. It’s part of their life. That’s put a coach in a position where they have to have the ability. To stand up to that pressure and perform against it. He makes it clear that finding an individual capable of resurrecting U of M’s once great football program will take money. “There’s a market out there and you pay for value. And the marketplace dictates what those price tags are. And I want you to know, my philosophy…and I believe my boss and my boss’ bosses understand that concept, we’ll do what we need to do to get the right coach to come to for Michigan." But what is the ‘market value’ for the right coach? John U. Bacon is an author of books about U of M football, including best-selling books about legendary coach Bo Schembechler. He’s also a Michigan Radio sports commentator. There are many potential candidates for the University of Michigan football job, some with ties to Michigan, and others who’ve been successful at other schools. 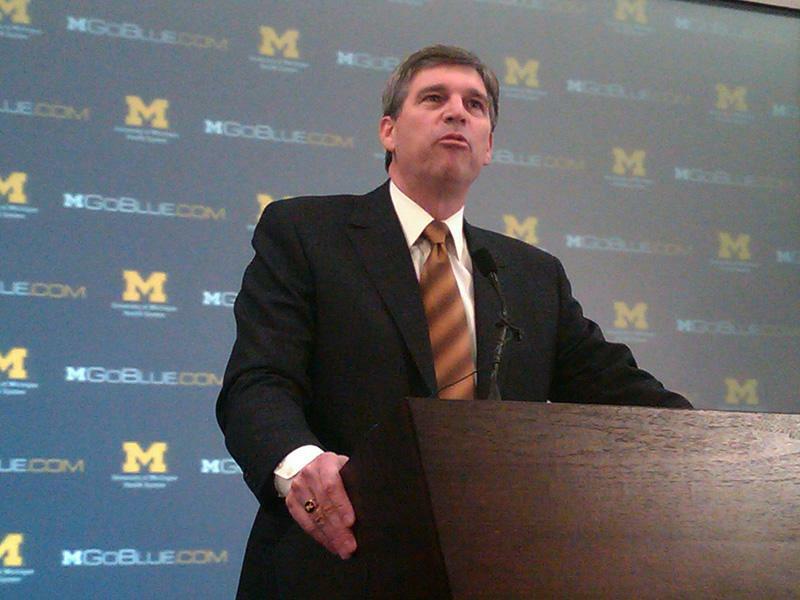 U of M athletic director Dave Brandon is expected to act quickly to fill what is one of the highest profile college sports jobs in the nation. The press conference has concluded. Brandon entertained a lot of questions about potential replacements for Rich Rodriguez, but said he has yet to talk with potential candidates and plans to do so soon. It appears Brandon plans to increase the amount of pay the next head football coach at the University of Michigan will receive. Rich Rodriguez had a six-year $15 million contract. Brandon feels Michigan has been in the "middle of the pack" in terms of coaching pay for top tier college football programs. Lots of media outlets in Southeast Michigan reported yesterday that University of Michigan football coach Rich Rodriguez had been fired. It wasn’t a surprise and everyone has been waiting for it to happen, and some listeners thought it was odd they didn’t hear about it on Michigan Radio. Want to know why? Well, couldn’t nail the rumors down as true, so we didn’t report it. Turns out that was the right decision.